Unbeaten Good Day paces Fox4's prosperous November "sweeps"
Fox4’s Good Day entered the D-FW ratings history book while the station also won all four major newscast races among 25-to-54-year--olds, the main advertiser target audience for news programming. The November “sweeps” ratings, which ended on Thanksgiving eve, show Good Day running first on all 20 weekdays at 6 a.m. in total viewers and the key 25-to-54-year-old demographic. Good Day anchors Tim Ryan and Lauren Przybyl, along with meteorologist Even Andrews and traffic anchor Chip Waggoner, literally were an unbeatable team opposite distant also-rans NBC5, TEGNA8 and CBS11. Topping the field on each and every weekday in both ratings measurements is a considerable achievement in times when brand loyalty is blowing in the wind. Fox4 also won the 5, 6 and 10 p.m. Nielsen ratings races among 25-to-54-year-olds and ran second by a sliver to NBC5 in total viewers at 5 p.m. The three rival stations each claimed one win apiece. In the November 2014 sweeps, TEGNA8 logged four wins while Fox4 had just two. TEGNA8 repeated from a year ago as the 10 p.m. champ in total viewers while NBC5 and CBS11 respectively did likewise at 5 and 6 p.m. But CBS11 again ran last across the board among 25-to-54-year-olds. Here are the complete November “sweeps” results for the four-way competitions at 6 a.m. and 5, 6 and 10 p.m. Year-to-year audience gains or losses are in parentheses. Comments: TEGNA8 overcame some generally skimpy lead-ins from ABC’s 9 p.m. entertainment programming to win relatively comfortably in total viewers. But the big one got away, with Fox4 topping the 25-to-54 ratings for the second consecutive sweeps period after winning for the first time in this measurement last May. NBC5 was the only station to show year-to-year increases in both competitions while TEGNA8 showed the biggest declines. Comments: Remember when early mornings were seen as a big growth arena for local newscasts? Not this time. Not this time at all. The four stations each lost viewers in both ratings measurements from a year ago, even runaway winner Fox4. CBS11 also forfeited any momentum it had from last May, when the station placed better than fourth for the first time ever among 25-to-54-year-olds by nipping TEGNA8. News director Mike Garber then broke the morning team in half by sending co-anchor Jason Allen back to the reporting pool while dumping traffic anchor Tammy Dombeck. Their replacements, Russ McCaskey and Chelsey Davis, haven’t caught on so far despite a heavy “Morning All Star” promotional campaign in which the new team gave away free coffee. CBS11’s personnel moves helped TEGNA8 to recover in part from its May sweeps embarrassment, even through the station had significant year-to-year declines in both total viewers and 25-to-54-year-olds. All told, the four stations lost 24,356 viewers in the 25-to-54 age range. Comments: The margin between first and fourth place in total viewers was just 9,349. So all four stations were in the hunt, although CBS11 hemorrhaged viewers from a year ago while still eking out a first place finish. Fox4 trampolined upward in both ratings measurements while TEGNA8 fell from first to third place with 25-to-54-year-olds from a year ago. 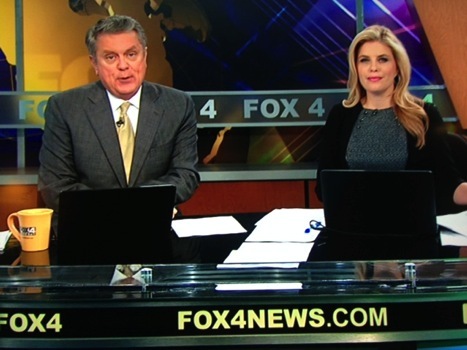 CBS11’s 25-to-54 demographics remain dismal, with its viewership less than half of frontrunner Fox4’s. Second place NBC5 enjoyed the biggest gains among 25-to-54-year-olds. Comments: TEGNA8 was tops with 25-to-54-year-olds in November 2014, but fell to a rather distant third this time around. Fox4 lost by a hair to NBC5 in total viewers and was the only station to increase its audience in both measurements from a year ago. CBS11 has miles to go and compounded its woes by being the only station to lose viewers on both scorecards. All in all, CBS11 fared the worst in November by also being the only station to lose viewers across the board in all four newscast competitions. TEGNA8 didn’t fare much better. It was on the year-to-year plus side only at 5 p.m. in total viewers. In contrast, Fox4 and NBC5 showed year-to-year increases on five of the eight scorecards. But the biggest celebration is at Fox4, which collected the lion’s share of gold medals and ran the table in the most valued 25-to-54-year-old measurement. The frosting on its cake came at 9 p.m., where Fox4 drew more viewers than for any of its other newscasts despite being in direct competition with network entertainment programming on ABC, CBS and NBC.